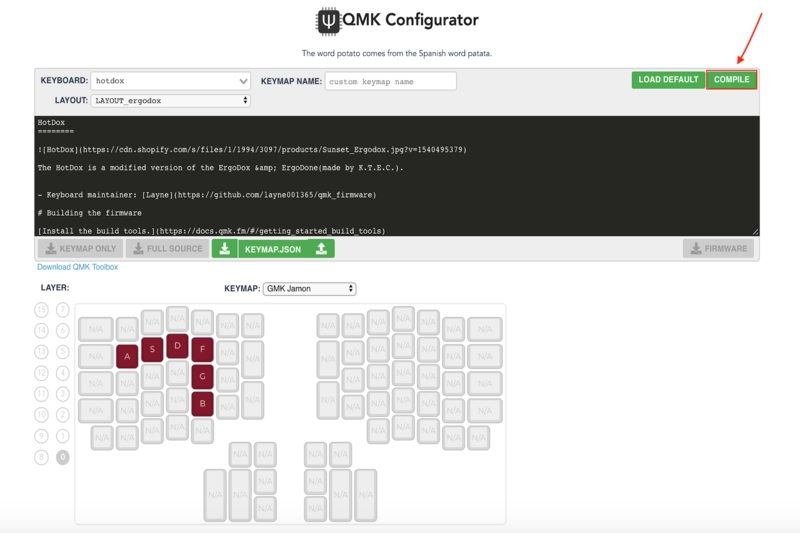 Click the button below to open the QMK Configurator (will open a new window). 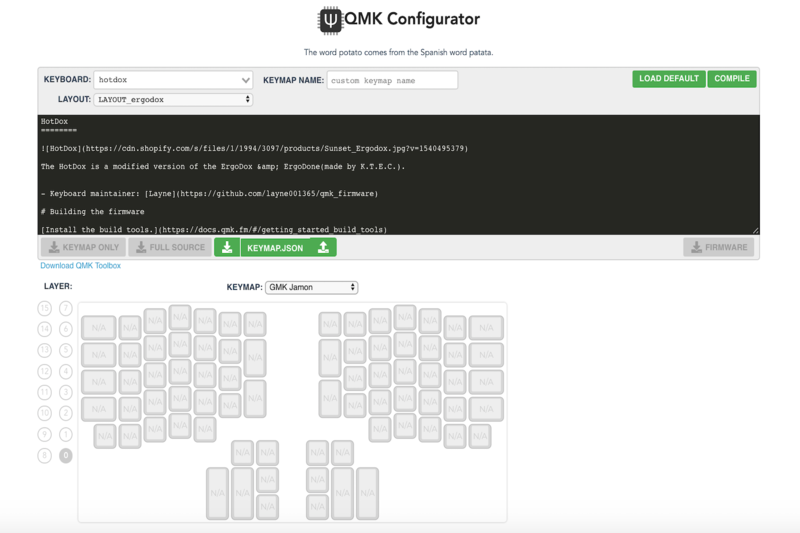 Did You Know.. QMK (Quantum Mechanical Keyboard) is an open source community that maintains the QMK Firmware, Toolbox & Configurator. 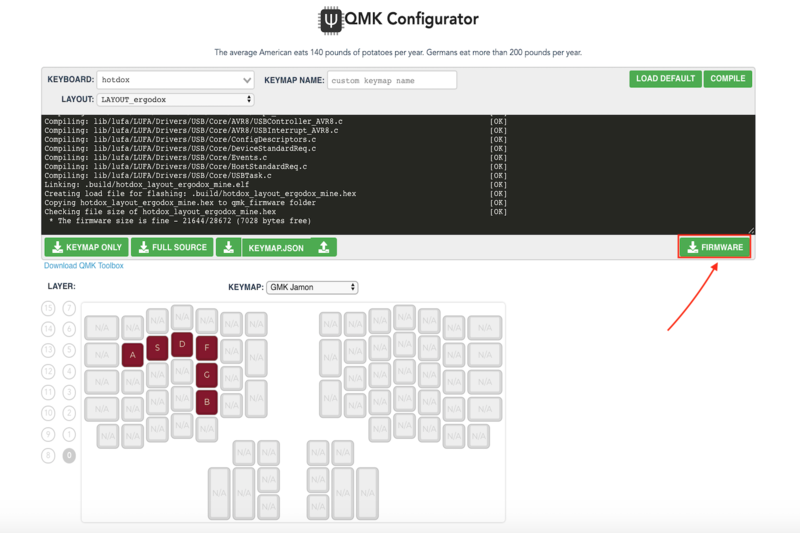 The QMK firmware is used by many of the most popular keyboards within the mechanical keyboard community. You will see a graphic representation of your Ergodox 76 Hot Dox. Click on any key on the Ergodox 76 Hot Dox illustration and it will change to a green border. Press the character you want on your current keyboard or use the keycodes at the bottom of the configurator. Your layout should now be updated your selection. Quick Tip.. The virtual keyboard at the bottom of the configurator is a handy tool to use when you do not have a second keyboard available. Continue configuring your keyboard until you are satisfied with your custom layout. Once you are finished, click on the “COMPILE” button on the top right of the black terminal window. Quick Tip.. You can also download the keymap as a JSON file to save and upload later. This saves time as you do not need to repeat your work! Once the configurator has finished compiling, the "FIRMWARE" button will turn green indicating your file is ready to download. Click the button to get the firmware which should be a .hex file. Quick Tip.. You are almost done! We just need to "flash" the firmware onto your Hot Dox. You will need to transfer (flash) your firmware onto the Ergodox 76 Hot Dox. 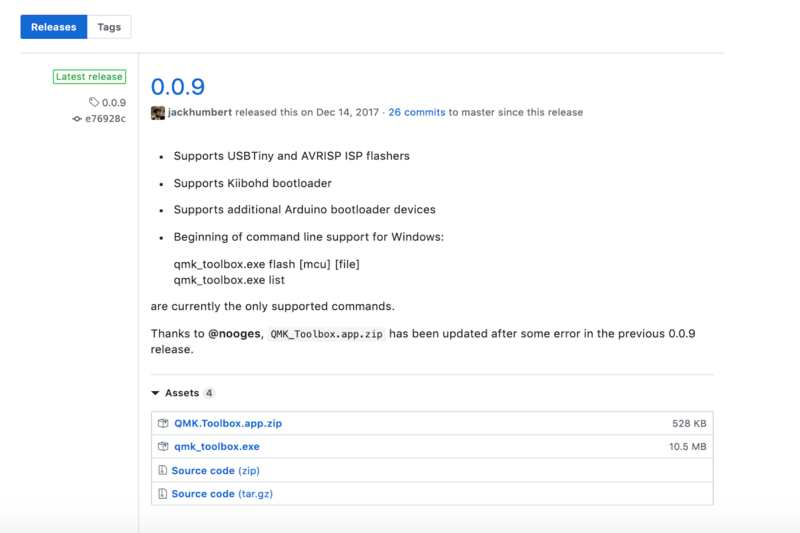 To do so, you will need to download the QMK Toolbox from the download page (click the button below). If you are using a Windows PC, download the .exe file. If you are using a Mac, download the .app.zip file. Quick Tip.. It is recommended to download the latest release. Open the QMK Toolbox application and click the "Choose .hex" button. 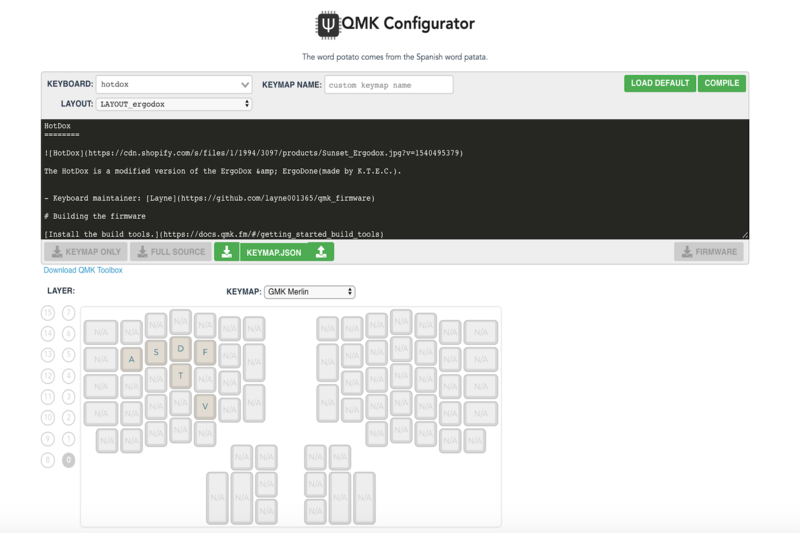 Find and select the .hex firmware file that you downloaded from the QMK configurator in Step 4. Did You Know.. 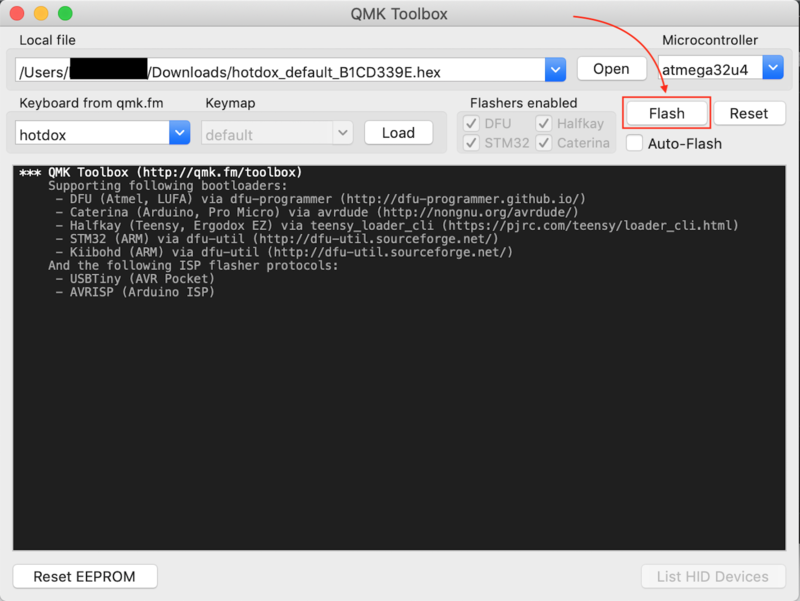 The QMK Toolbox takes the configuration file and "flashes" your keyboard with it. If your Hot Dox is not plugged into your computer, do so now. On the bottom of the right half keyboard/PCB of the Ergodox 76 Hot Dox is a small reset button. Press the reset button. Did You Know.. You are almost done! Do a final check, ensure the .hex file you selected is the right file. Ensure your Ergodox 76 Hot Dox is plugged in and that you have pressed the reset button. When you are ready, click on the "Flash When Ready" to complete the flashing process. Congratulations, you have customized your Hot Dox your way!